Medical technology has made leaps and bounds in the area of pet treatment, but the high costs and emotional risks are felt by both owners and veterinarians. 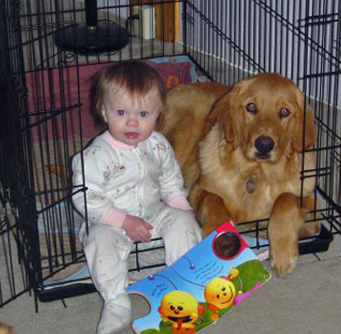 This little girl used to read to Turbo the Golden Retriever. The photo was taken years ago, just months after Turbo and his brother, Jazz, had been adopted. How much would you spend to save your pet? How much of a guarantee would you need to know he would survive? How much time would you be willing to “buy”? Where would you get the money? In a recent New York Times article, “Old Dog Needs $6,000 Surgery. What Do You Do?,” a young couple and both sets of in-laws chipped in to come up with the funds needed to perform emergency surgery on Max, a 13-year-old Bichon Frise. The outcome? As in the Visa commercial, priceless, according to Max’s extended family. I live and breathe these issues with owners every day. It is exhausting and painful. Heartbreaking and taxing. There are often no right answers. Everybody’s situation is different. Veterinarians aren’t becoming more greedy, or “pushing” high-end procedures or diagnostics. I take exception to people who think of us this way. Veterinarians are among the lowest-paid professionals of all the medical professions. That’s a fact. But although we do not become wealthy ourselves from high-tech medicine, we are able to offer these state-of-the-art options to diagnose and save your pet’s life. Many times, these options are not simple or cheap. Take Max, the dog in the Times article, for example. Without ultrasound, advanced surgical technique, critical patient anesthesia monitoring and ICU technology, he could not have survived the involved and risky abdominal surgery that saved his life. This care does not come easily or without a price tag. Back in the day, folks could feel okay about putting “the old dog down” because his belly hurt; the option of human-grade emergency surgery on a septic abdomen to save him simply didn’t exist. Or when a young dog couldn’t walk because he was born with hip dysplasia, the owner didn’t have the option of total hip replacement. Today those procedures are routine, but the bills run in the thousands. Of course, the SAME procedures in human medicine can run in the millions. Veterinary care is priced below what it truly costs in many instances. Human care might be placed more appropriately if insurance companies weren’t making billions of dollars of profit. Turbo shows off his new belly scar. This week’s story is about a 114-pound Golden Retriever, Turbo. He became acutely ill on New Year’s Eve, diagnosed with fluid in the sac around his heart, making it hard for him to breathe. This is called a pericardial effusion. In an older Golden, this often means cancer caused by a metastatic tumor on the heart. The name of the tumor is hemangiosarcoma. It is often found in the spleen, the liver, the heart and can metastasize to other organs. It is ultimately fatal. Luckily, Turbo responded to having the blood drained from around his heart and went home. But one week after that, he had a seizure. The concern was that he may have cancer in the brain, too. I put Turbo on anti-seizure medicine. A cardiologist performed an echocardiogram and prescribed heart medications. His heart seemed stable, and the seizures were controlled. The owners wanted me to find out what more they could do for him. We did an abdominal ultrasound and confirmed tumors on his spleen. All the veterinarians involved in the case were worried that Turbo most likely had hemangiosarcoma in multiple organs. The decision of how to proceed was a difficult one. Surgery was very risky, and there was no guarantee that putting the dog through an involved surgery would buy him any real quality time. While we were mulling over decisions, Turbo put in his two cents. The tumors on his spleen began to bleed. Without surgery, he was sure to die. The owners asked me to perform surgery and remove Turbo’s spleen. I told the owners it was too risky to be done in my hospital. I wanted them to be at a university hospital or speciality hospital in case his heart gave us trouble, if he began to seize or if he needed multiple blood transfusions. They pleaded with me to do the surgery. Not happy with this situation, I agreed. I was worried they may not be able to take him to a referral hospital, that the cost would finally be too much of a burden. They would be saving thousands of dollars if the surgery was done at my hospital. Under duress, I removed the huge, bleeding spleen from the dog. The spleen had already ruptured. These big bleeding organs have to be removed carefully, without causing more blood loss or compromising other organs. The patient can suffer heart arrhythmias and any number of cardiovascular or catastrophic anesthetic events. Turbo’s heart never missed a beat. He didn’t need a transfusion. He didn’t have a seizure. The big dog went home the next day, dancing down the driveway. Against all odds, Turbo was on a very good roll. The guardian angel of Golden Retrievers was still perched happily on Turbo’s broad shoulders. The biopsy results on the spleen were no surprise. Hemangiosarcoma. Now the diagnosis was definite. When Turbo returned for suture removal, the owners had done their internet homework. They asked me about chemotherapy. Again, I was reluctant. Current chemo protocols might buy the big pup a few months, but I was worried about the side effects of chemo and whether it was worth it or not. The chemo drug used, doxorubicin, can be toxic to the heart. We already knew Turbo had heart issues. We would have to be careful. The owners were all good to go. Anything to extend a good life for Turbo. We began the chemo. Turbo has had three treatments, two weeks apart, and is doing great. He’ll get his heart checked again by the cardiologist this week before we give him the last two cycles of chemo. He barks happily at the other dogs while he spends half a day with us for his chemo, and he lays his big head on my technician during his intravenous infusion. He eats cookies during his treatment. In the beginning, he didn’t eat our cookies. Now he dines with us every chance he gets. Turbo and Jazz have always been close to each other, even in the early days. 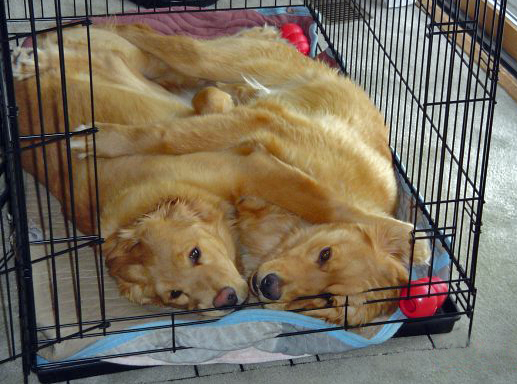 They would crawl into their crate and lie down for hugs. Turbo’s owners have always been aware that he is on borrowed time, but they are happy with their choices so far. And Turbo has helped with that decision. He has responded to all his medications, recovered well from surgery and has not had any hardship with chemotherapy. Veterinarians and owners grapple with these decisions on how far to go with treatment all the time, and it’s stressful, emotional, painful…for everyone. Often it’s about the money, but not always. If Turbo had different owners, they may have decided against surgery, or chemo. Those would have been valid choices, too. Max, the Bichon, could have suffered in the ICU unit for several days and died. Turbo could have died in surgery or suffered complications that hastened his death. No matter how advanced the medicine, we don’t know what’s going to happen. I have been taking care of Turbo and his brother, Jazz, since this fine family rescued them as 9-month-old pups in 2004. I also took care of their wonderful dog that preceded Turbo and Jazz. For this family, the sight of Turbo running out of my clinic to play with his brother, guardian angel in tow? Priceless. This pet health content was written by a veterinarian, Dr. Debora Lichtenberg, VMD. 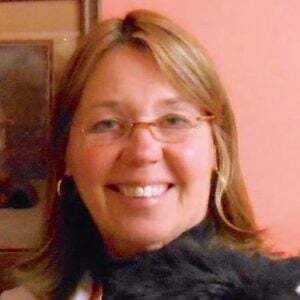 It was reviewed for accuracy by Dr. Pippa Elliott, BVMS, MRCVS, and was last updated Feb. 4, 2019.